Dental disease is the most common disease affecting pets. According to Banfield Pet Hospital's State of Pet Health Report, more than 90 percent of dogs over the age of 3 suffer from dental disease. February is National Pet Dental Month and today we are chatting with Banfield veterinarian Dr. Andrea Sanchez on how to protect our pets from this common disease that can lead to life-threatening conditions if left untreated. Watch the video to see what Dr. Sanchez has to say about dental care, including demonstrating on her doggie the "Flip, Check, Treat" regimen to protect against dental disease, and a daily home treatment that will help maintain healthier teeth and gums for your precious pooch. Dental disease in pets can lead to life-threatening conditions if left untreated. When severe, it can lead to bacterial infections. Sanchez says a correlation has been seen between dental disease and chronic diseases of the heart, kidneys and liver, and even organ failure. It is important to learn, recognize and regularly check for the signs of dental disease/poor oral health -- not only during National Pet Dental Health Month in February, but all year long. Symptoms of dental disease may be hard to notice, so it's important for pet parents to become familiar with the signs to avoid major health problems. 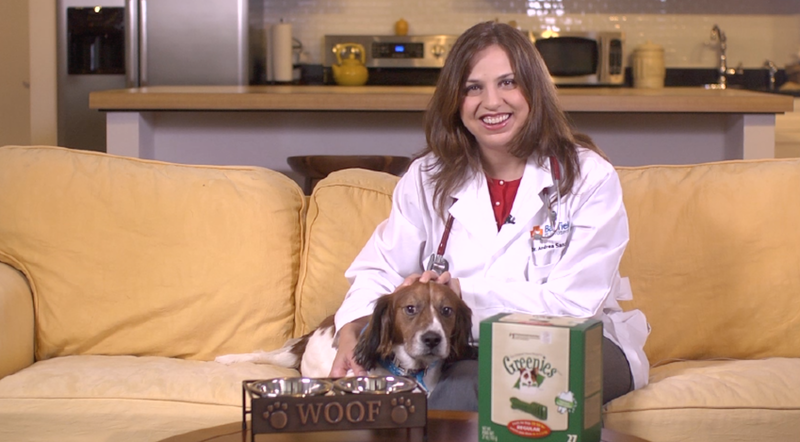 Dr. Andrea Sanchez partnered with Banfield and the Greenies Brand, both part of Mars Incorporated to bring us this interview. Great points and we so know how important dental health is from an early age. We take it very seriously here. Have a terrific Tuesday.